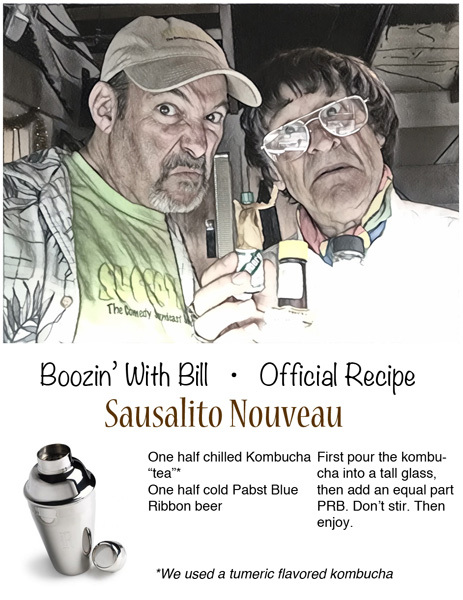 Succotash Clips Epi156: Boozin' with Bill is Back! It's just me, Marc Hershon. Your host and Kentucky Blue Grass for Epi156 of Succotash, the Comedy Soundcast Soundcast. We’re back with another installment of Succotash Clips, where we feature some comedy snippets from the width, length AND depth of the internet. Our associate producer Tyson Saner and I combined forces to pull down samples from the following shows for this week’s selections: And God Created Podcast, Gone Riffin’, In Poor Taste, Juice In The Morning, Podcast For Laundry, Live from the Poundstone Institute, and Your Mom’s House. In addition, we not only have a double dose of our Burst O’ Durst with political comedian and social commentator Will Durst, but also a BONUS Durst bit – the opening segment from his new one man show in San Francisco, Durst Case Scenario. 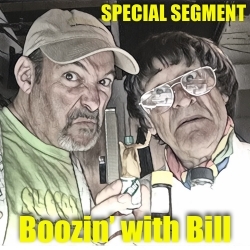 And, for the first time in what seems like forever, we bring back the segment featuring out own Bill Heywatt, none other than Boozin’ With Bill! Yep. Bill and I belly up to the Studio P wetbar and he’s gonna whip up one of his oddcoctions. This week’s episode, as always, is brought to you by our friends at Henderson’s Pants. We’ve officially kicked off out own Patreon page, since the selling of commercials hasn’t been going so well. So this is your chance to help us out by contributing to things like the production and hosting costs for this show. You, essentially, get to become an adjunct producer of this show for just a buck a month. Just click over to http://Patreon.com/Succotash and kick into the kitty. I’m not asking for a lot. Yet. Mainly because I’m still figuring out how the damn thing works. At some point, if people start popping in there, I’ll start pulling together some exclusive content, special interviews, and some other treats I haven’t even dreamed up yet. We start with a bit of a brand new soundcast from an old friend of mine. This comes from Epi1 of Live from the Poundstone Institute, hosted by comedian Paula Poundstone. She’s appeared a lot on A Prairie Home Companion and NPR’s Wait, Wait Don’t Tell Me, but now she’s got her own show for NPR. I recently reviewed it for Splitsider.com and it’s a pretty entertaining romp in front of a live studio audience. It’s pretty short – the debut episode runs just a smidge over a half hour – and she crams in a bunch of short visits from smart people like scientists and professors as well as celebrities. In this clip, she’s going deep on the sexual proclivities of the Tyrannosaurus Rex. Our next offering is from our Associate Producer Tyson Saner’s fresh crop of soundcast clips. It’s from Juice in the Morning. The host is Justin “Juice” Kelly and on the homesite for this show he says, “I do this show as a hobby but maybe one day it will be more than that!” He’s got more than 60 episodes under his belt at this point, so he’s well on his way. This clip is from Episode 65 and Juice is talking to frequent guest Thomas Smith, who may also be the show’s producer from what Tyson could find out. There’s another brand newish soundcast – just a few episodes in – called Podcast for Laundry — I am beginning to think my campaign to change the term podcast to soundcast is maybe not catching on as fast as I was hoping but I’m going to keep on it mainly because I think it annoys people — but Podcast for Laundry is a show hosted by comedian Brett Davis on the Forever Dog Network. Brett is a winner of the Andy Kaufman Award and, like Andy, Brett often performs as one of a number of characters he’s created. This podcast is a great example. It is recorded in a laundromat and the guests don’t seem to be very happy to be there. His first guest is Tom Sharpling, host of The Best Show, and he’s got some unpleasant feedback for Brett. Soundcasting continues to get more and more “niche-y”. Not Nietzsche, although that may be true as well. And it’s making for really interesting content, which is good. The medium can probably only sustain so many pop culture-oriented shows with a bunch of dudes shouting at each other. Tyson scooped up a clip’s worth of a new entry called And God Created Podcast. So new that there’s only one episode up on SoundCloud so far. It features Stephen Peltier, Cassandra Cardenes, Erika Curry and Mickey Broussard, and although the hosts seem to have religion in their childhoods, they’re not really into it as adults. They’ve decided to revisit the stories in the Bible without religious bashing but really just checking out the stories as stories. We got a clip submission from Eric Driscoll and Sean Kendle, hosts of the In Poor Taste soundcast, who used our direct upload link through Hightail.com. Full disclosure, I had a DM interchange with Sean on Twitter last week about a bunch of stuff and one thing was this clip. Even though we ask that the clips run 3 to 5 minutes – and believe me, five minutes can be a LONG time in Soundcastland – he said the best they could do was 6 minutes. Well, gents, after listening to it I thought of a couple of cuts to make everything flow a little smoother. Apologies to your comedy timing sensibilities if this cut pisses you off, but know that I did it with the best of intentions. Total running time: 3 minutes and 52 seconds. We have a clip from a show that been around for awhile, over 400 episodes to be exact. And although we clipped the solo soundcast from one of the co-hosts back in Succotash Epi149 (the That’s Deep Bro show hosted by comic Christina Pazsitzky), this is the first chance we’ve had to clip Your Mom’s House with Christina and her husband, comedian Tom Segura. (Tom also host HIS own soundcast, called Charge It To The Game.) Now we finally get to play a snippet from Your Mom’s House, from recent Epi403 with no guest, just Tom and Christina, talking about being sick and the danger of golf carts. We wrap up the clip portion of this epi with one that Tyson grabbed us from another newbiecast called Gone Riffin’ on the Feral Audio Network. Hosted by Rich Fulcher and Abed Geith, they’re about seven 'sodes in and the clip we have is from Epi2. You may recognize Abed as “The Real Abed” from the Harmontown soundcast and Rich is a comedian, writer, and improvisor, whose been on Snuff Box, Drunk History, and The Mighty Boosh. We’ve officially kicked off out own Patreon page, since the selling of commercials hasn’t been going so well. So this is your chance to help us out by contributing to things like the production and hosting costs for this show. Just click over to http://Patreon.com/Succotash and kick into the kitty. I’m not asking for a lot. Yet. Mainly because I’m still figuring out how the damn thing works. At some point, if people start popping in there, I’ll start pulling together some exclusive content, special interviews, and some other treats I haven’t even dreamed up yet. Also, check out the Laughable app from our buddy Ned Kenney. Have you snagged the app yet? This thing is first rate for finding, subscribing and streaming or downloading the funny. It’s got a great search algorithm, so you can find your favorite comedians on all the soundcasts they’ve guested on, too. It really is a great soundcast companion to have on your smartphone so go to laughable.com or just download it from the App Store for iOS. I’m told there’s an Android version coming soon. That’s gonna do it. Next time it’s a Succotash Chats installment with our old friend-of-the-show and returning guest Jordan Brady on the eve of the release of his movie, I Am Battle Comic. But until then, thanks for passing the Succotash. Hey, look. Or listen, rather. It’s me, Marc Hershon, your host and carpet remnant for Epi155 of Succotash, the Comedy Soundcast Soundcast. I had a delightful bunch of soundcast clips lined up but then got the chance to chat with one of my more popular soundcast contemporaries. So I decided to go with another Succotash Chats installment and hold the clips until next time. Our special guest this episode is Matt Besser, host of the improv4humans soundcast and one of the founding members of the Upright Citizens Brigade, which has become one of the guiding lights for improvisational comedy in the US. 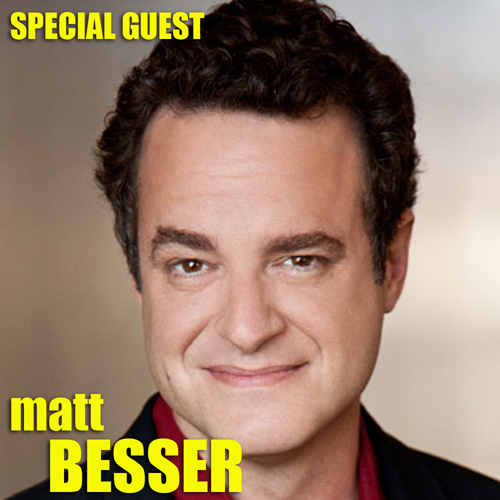 I wanted to talk with Matt because of a special improvised narrative trilogy that he’s been doing recently amongst the regular improv4humans episodes, a three-part story entitled The Mopes. Along the way we chatted about how he first got up to speed on doing improv in Chicago, what it was like to hold down “normal” jobs before getting in the business of show, and some future improv-based plans for TV that he hopes will come about. Bookending that conversation is a double shot of our Burst O’ Durst segment with political comedian and social commentator Will Durst. And this episode of Succotash is brought to you by our friends at Henderson’s Pants and their oh-so-comfy Chillin' Churidars. If you'd like to help us out in spirit only, please go to our listing on iTunes to rate and review Succotash. Those 5-star ratings help push us up into the light. Starting with this month's episode 6, I am lending my voice as the announcer for The Los Angeles Breakfast Club ON THE AIR soundcast, hosted by Phil Leirness. Check that ou for a fascinating look at a fascinating LA institution that's almost 100 years old. Next episode I should be returning with a Succotash Clips show BUT there are a couple of more interviews on deck, so those may take precedence. Nonetheless, if you're a comedy soundcaster and would like us to feature a clip from your show, you can get a 3-5 minute MP3 clip directly to us via our upload link, at http://hightail.com/u/Succotash.